Sometimes I look at my Middies and wonder what on earth I was thinking when I decided that introducing a new size of doll into my doll family was a great idea. This is mostly because it’s hard to dress them sometimes. 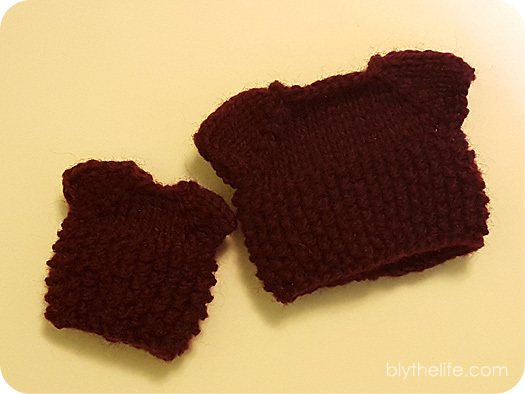 On occasion I wind up making them sometime, but it’s almost never anything sewn because I’m bad enough at attempting to sew in straight lines for the full-sized Blythes – it’s hardly going to happen for the Middies (or… the Petites). But I am always wrong with the idea that Middies aren’t a great idea, because they are – they’re here and they’re here to stay. They are adorable and pocket/purse friendly. Not as pocket/purse friendly as a Petite, but they’re big enough that you’re not likely to lose them. 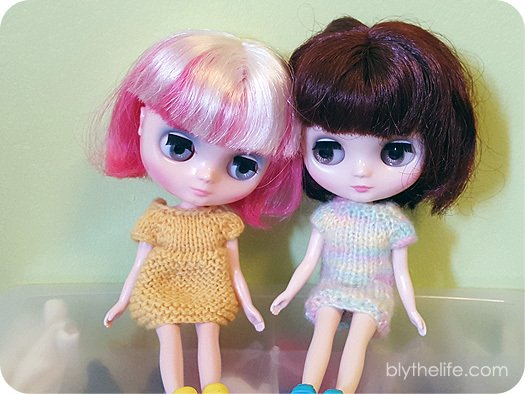 They have small feet – this means that you can justify shopping for even more doll shoes because the ones that feet Blythe or Licca feet will not feel Middie-sized feet. They have small bodies. If you knit or sew, it doesn’t take that much yarn or fabric to craft something for them. The head tilt. Super adorable, super cute, reminds me of a little kitten or puppy tilting their head while watching you eat with that “Are you sure you’re going to finish that?” look. There is something about them that I cannot put my finger on, that makes me just not interested in buying one. Maybe it’s because of the whole having to buy smaller doll clothes unique to the doll itself. I can’t say why, but it is doubtful in the future that I will own one. 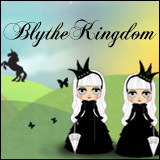 I have three full Blythe ladies, and would love to add a Middie. Does anyone have any suggestions as to best prices/places to buy? 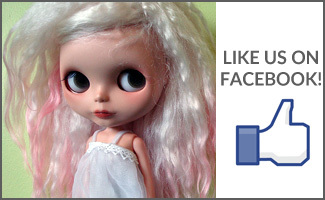 I got mine on the Dolly Adoption FB group. Prices are pretty good there. My first Middie was Melanie Ubique Girl and I was so disappointed. I sold her on Ebay. 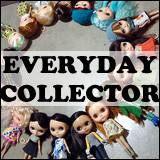 I had already preordered Mary Ann because I had ordered Dark Rabbit Hole Blythe. I was very worried I had made a grave mistake since Mary Ann was already ordered and I hated MUG. Once she arrived I had a new faith in Middies. She is so cute with beautiful eyes and hair. She was worth it. Everything about her is special. But due to her size, she has a very limited wardrobe. I’ve learned that I really need to have that deep gut feeling that I absoutely love the doll before I buy another. Since I only have one right now, I will splurge occassionaly and buy her a little something. My preference will always be for Neo Blythes. I sometimes get frustrated with my lack of wardrobe for my Middie, but I’m so glad I got her. I have Jackie Ramone and her style is just so right for me! I find her inspiring and I’m really enjoying designing knitting patterns for her these days!